Bean bag chairs are such a fun piece of furniture to own. No matter what type of home you have, or what type of room you are planning to decorate, they can add a bit of character to just about any style room setting. Children love them because they are really close to the ground and easy to snuggle up in. They can lounge around and watch cartoons, use them as a pillow to rest their heads on, or even sit in them while doing arts and crafts projects. Adults can benefit from their use too. It has been said that if you have back trouble a doctor might often recommend this type of chair to help ease your aches and pains. Or of you're in a cast or have arthritis and sitting in a traditional rigid chair sounds just awful! It's amazing how many generations this chair has actually made it through, from toddlers growing up to teens, then to college, then adults, then parents, the grandparents, then it starts all over again! And still it holds strong as a popular furniture choice. Almost anyone can attest to owning one or more of these chairs at least once in their lifetime. If not as an adult, chances are they owned one as a child, or while they were away at college. Heck, your college student lounge probably sported a few! So where did this magnificent piece of furniture come from? The very first bean bag chair-like creation was invented by Roger Dean while he was studying at the Royal College of Art in the UK in 1965. His creation, the Sea Urchin, was really the first of it's kind, being a non-rigid foam chair that allowed you to sit in different positions. He filed a patent on February 12, 1968, and patent number 3495874 for the Sea Urchin chair was issued on February 17, 1970...just in time for the hippie generation to really lounge out! It is now on permanent exhibition at the Victoria & Albert Museum in the United Kingdom. Mr. Dean is now a world-reknowned artist of fantasy art and design. Sea Urchin Chair 1968 - Rad, Man! In 1969, The Sacco chair was introduced by three Italian designers. Piero Gatti, Cesare Paolini & Franco Teodoro supposedly accidentally created this early bean bag when they realized that the bags being filled with Styrofoam leftover pieces at their company (Zanotta) was a pretty good chair! Sacco chairs were originally made of leather and are still pear-shaped. Zanotta actually still makes bean bags to this day! Sacco chairs became wildly popular in the 1970's when they started being sold en masse around the globe in stores. A couple decades later, bean bags had created a solid niche in the furniture marketplace. But, sadly, in the mid 90's, millions were recalled because kids were unzipping them and inhaling the loose filling. Today, the Consumer Products Safety Commission provides a guideline for all manufacturers to equip their products with child-resistant zippers that cannot be easily opened. 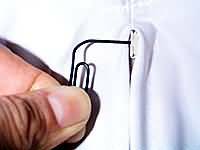 Zippers need to either be completely disabled or somehow locked so they cannot just be unzipped without some type of tool. Many lower-quality products simply break the zipper, permanantly disabling it. Better-quality ones have zippers that lock and relock with a tool. Today, many companies manufacture and sell both in "brick-and-mortar" stores and online, reaching customers on every continent. Most are manufactured in Asian factories, like China, and resold under private label. There are a handful of companies that manufacture in the United States. Ahh! Products is one such company, located in Virginia. They opened their doors in 1998 with the idea that bean bag chairs should not only be comfortable and practical, but stylish as well. Up until then, there weren't many choices of textures, colors, or prints. Vinyl was still the norm in solid colors, with relatively few choices in cloth or woven fabrics. Ahh! Products manufactured and sold their own version of the chairs, not only adding a huge selection of fabric choices in covers that were washable, but also introduced their exclusive water-repellent, microfiber inner liner that protects the filling so you can easily wash the cover. Liners are equipped with child-resistant zippers. Within a few years, many other manufacturers began making washable covers a part of their product offering. Ahh! Products leads the industry in style choice, while other companies also expanded their lines to follow the demand. Ahh! still sells theirs to this day. 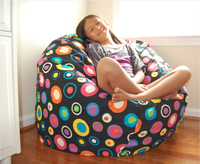 Bean bags nowadays can be found in millions of homes, schools, offices, libraries, hospitals, etc. They are used by kids, adults, and even for pets to sleep in as a bed. College dorm rooms are another place where you will often find them. They take up hardly any room and can be thrown down in a pinch for any surprise visitors. Use them for a small get-together or make yourself comfortable while playing a video game. They also make a great accent to your outside décor. Place them along your deck or right next to the pool. Not only will your guests love their comfort, they will also be amazed at how stylish they make your poolside décor look. With a good imagination, and a great eye for style, you can add them as a great accent piece just about anywhere. So, our gratitude and thanks to Mr. Dean, the Italians, and everyone who has been instrumental in creating and elevating bean bags to what they have become in the 21st century!